February 10. Speed Rack. The sun was shining high in the Seattle sky as I made my way down to the Century Ballroom. The day was promising to be beautiful, though much of it would be unknown to me. My day would be spent inside watching contenders shake and stir their way toward the illustrious title of Miss Speed Rack Seattle. What would begin with 19 talented bartenders, would end with one woman raising her hands in victory as the judges proclaimed her the winner. As I arrived, the ladies were just preparing to enter the preliminaries. Some were local, but others had traveled from as far as Spokane and Portland. The Tin Tables’ wells served as the focal point. Each areas was dotted with shakers and long-handled spoons, Hawthorne strainers and julep strainers all marked with pink electric tape. As a contestant made her way behind the stick, she faced down the necessary glassware already lined up on the varnished wood. Four drinks would test them: whiskey sour, margarita, sidecar and a gin martini with orange bitters. Oh, and then there was the clock. Meanwhile the activity continued as the Century Ballroom was reshaped to house the competitive bar event. Portable bars were set up on stage, as well as the judge's table. Numerous punches were batched by the volunteer barbacks, all talented bartenders in their own right. The punch stations were set up around the back of the room, all with excellent vantage points for the action that would engulf the room later that day. Nothing seemed to garner more attention in those hours of preparation than the arrival of the giant ice sculpture of a bottle of Green Chartreuse, from which ice luges would be poured all afternoon long. As the day moved steadily along and the final 8 were chosen, the activity reached a frenetic pace. The host of volunteers entered and were assigned to various serving positions. 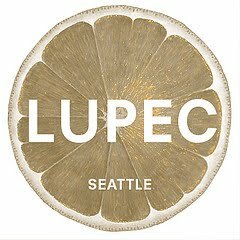 Several LUPEC Seattle ladies took their post with punch ladles. With a half hour to go before the event officially opened, the line of attendees wrapped around the building. The excitement reached a fever pitch as the ladies of Tilted Thunder Roller Birds skated across the hardwood floors, raffles tickets in hand. The event was destined to be memorable. When the doors finally opened, the thirsty public started to fill the room, checking out the various offerings. But all eyes were soon trained on stage. Shortly after the four judges, Kathy Casey, Anu Apte, Robert Hess and Audrey Saunders chose the cocktails, the action took off. The crowd cheered as their hands flew to the bottles in a mad dash to not only prepare but garnish the four beverages. In the end, the judges were tough but fair as they appraised cocktail after cocktail. Who knows how they were able to withstand the onslaught of wonderful drinks and not only remain objective but keep their palates in tune. As the opening round came to completion, only four were left standing: Lacy Hawkins, Angel Teta, Missy Cross, and Beckaly Franks. In a surprising turn of events, the finals ended up being a rematch of last year's Speed Rack Portland--where last year's Miss Speed Rack Portland, Missy Cross, would face off against Lacy Hawkins. This year it was Lacy Hawkins who took home the title and was bathed in champagne. She will go on to compete in the Speed Rack Finals, held in New York City on May 16. Regardless of the winners and losers, the day was incredible. From the shots to honor Anu Apte's birthday to the champagne cocktails to toast the winner, the event was filled with an air of camaraderie and celebration, and a bit of friendly but fierce competition. Of course, we should not forget that all of the proceeds were raised to support a very worthwhile cause--breast cancer research, education and prevention.